VOTE YES on Tuesday April 8th, 2014. Question #1 on the ballot proposes a 3/8 of one percent sales tax on retail sales for the purpose of providing central dispatching, fire protection, emergency ambulance service, including emergency telephone services and other emergency services. With the loss of so many landline phones in the county, the funding of our 911 Enhanced emergency phone system is critically low. Additionally, no money is received from any cell phone companies to help fund 911. This sales tax is vital for 911 to stay operational in its present state. This tax will replace the 15% surtax on landline phones currently in place to fund 911 operations. Please share and encourage others to get out and vote on this important issue. HELP WANTED: Wri-Tex E911 is taking applications for a part-time dispatcher who is willing to work midnight shifts and others as needed. Must have valid drivers license and pass background check. Applications are available at the the 911 office until July 30, 2012. Business office hours: 9:15-4:30pm closed for lunch 12:30-1:30 and closed on weekends. 417-967-5309 Must be 18 years old and have a high school diploma/GED. We are localed on the Texas County Memorial Hospital campus at Houston, MO. Wri-Tex E911 has a Power Point Program that we will be more than happy to show at any event. We can set up for any school, Neighborhood Watch Meetings or any organization that wants to know more about 911. For more information just call me at the office: 417-967-5309 Mon-Fri during regular business hours. Great News since this came out in the Houston Herald. Taylor has been accepted as the State 911 hero for Missouri. 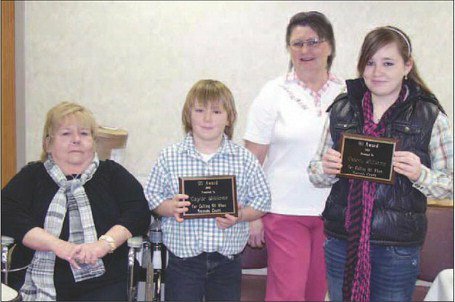 He will be presented the award on March 15 at an Award Banquet at Tan-Tar-a by MONENA (Missouri National Emergency Numbers Association) This award is by MONENA for children under the age of 12. He is the second person to win this award by being nominated by Wri-Tex E911. 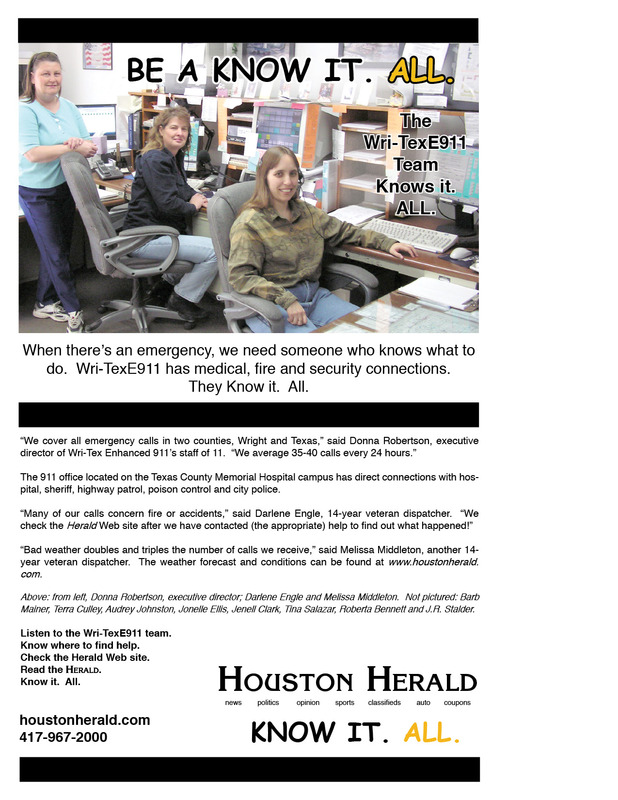 Wri-Tex E911 is seeking a part time dispatcher. Must be willing to work midnights, or any shfits as needed. Must have a high school diploma or GED. Background checks on applicants, must have a valid drivers license and reliable transportation. Starting pay $7.75 per hour. Applications are availavle at the 911office. 417-967-5309. The Missouri Chapter of the National Emergency Number Association (MONENA) recently presented 10 y.o. 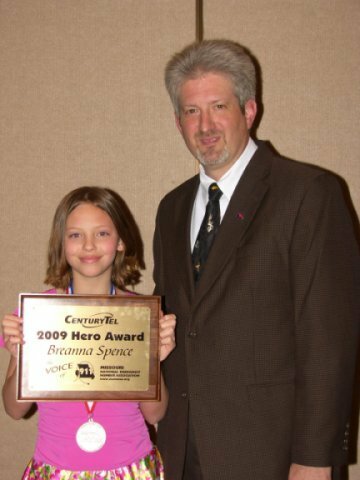 Breanna Spence from Summersville, MO with the 2009 HERO award. Breanna was honored by the state’s 9-1-1 organization at the banquet and awards ceremony that is held annually by the association. The MONENA annual conference and trade show was held at the Tan-Tara Resort at Lake of the Ozarks. The award was presented by Michael Kindle, President of the association and director of MaconCounty Enhanced 9-1-1 and Donna Robertson, 9-1-1 Director of Wri-Tex County who nominated Breanna for the award. The HERO award for Missouri is sponsored by Centurytel. Last May, Breanna was at home in the early morning hours when she woke up to a house full of smoke. She was able to make her way across the house through thick smoke, to wake up her dad. She then traveled back through the smoke to find her sister, and help her exit the house, while her dad was getting her mother and little brother out of the house. While helping her sister, Breanna grabbed a phone on the way out and called 9-1-1. Although sleepy, she was very calm, and described to the 9-1-1 dispatcher what was happening as her dad was fighting the fire. For knowing what to do in an emergency, and placing the 9-1-1 call that saved her families home, Breanna is truly a HERO.